Disaster Multiple fire companies, with 13 tankers and aerial support, fought the fire at Scott’s Landscaping for more than six hours before it was manageable. Scott’s Landscaping recovered—and grew—after a fire three years ago. Could you? You are sitting at a Sunday dinner with your wife and friends when you get a notification from your security provider. The smoke detectors at the headquarters of your landscape business are ringing. You think it’s probably a false alarm, so you don’t worry. This wouldn’t be the first time the alarm has gone off, especially on a windy day. I’ll check it out after dinner, you think. You leave the dinner and drive to your office, three miles down the road. When you arrive, smoke is billowing out of the windows. You’re smart enough not to go in. You make a difficult call to your wife. “It’s real,” you say. You feel helpless as you wait for the fire trucks to arrive and watch the orange glow of flames grow in the night. Don’t think this could happen to you? Until Nov. 10, 2013, neither did Scott Burk, president and CEO of Scott’s Landscaping in Centre Hall, Pa., five miles from State College. Scott’s Landscaping could’ve been one of the 40 percent of businesses that shutter in the wake of a fire, according to the Federal Emergency Management Agency. Instead, it grew by 20 percent the year of the blaze. This year, the company— which draws 40 percent of its revenue from construction, 30 percent from erosion control, 20 percent from maintenance and 10 percent from its nursery and serves a 60 percent commercial, 40 percent residential clientele—is on track to do more than $9 million, a $3 million bump in revenue since the fire. The road to recovery was not easy, but Burk did have some luck on his side. Scott’s Landscaping’s survival is the exception to the rule. Companies without some sort of plan in place often end up failing after a disaster like a hurricane, flood or fire, says Scott Teel, vice president of marketing at Agility Recovery, a post-disaster recovery services provider. If a disaster afflicts your business, do you have a plan to fall back on? In the small town, word of the fire got around as it burned. About 20 employees showed up that night to offer support. Windy conditions fanned the flames, and multiple fire companies with 13 tankers and aerial support struggled to put it out. The 8,500-square-foot wood structure burned uncontrollably for six hours. The employees pulled equipment parked outside away from the blaze, but there wasn’t much else they could do. A fireman drove a hydroseeder, covered in flames, through a garage door to safety, and the machine was salvaged. Once the fire became more manageable, employees were able to remove other equipment and a few water-logged file cabinets. Melany Tapia, owner of Tapia Technology Consulting, the IT company that handles Scott’s Landscaping’s data, remembers getting a call from Burk at 3:00 a.m. the night of the fire. She began implementing a recovery strategy immediately. Recovering the company’s files and data was Burk’s No. 1 concern—and rightfully so. According to a report from technology research firm the Gartner Group, 43 percent of companies closed immediately after a major loss of computer records. Another 51 percent permanently closed their doors within two years—leaving a mere 6 percent survival rate. Separation Scott Burk says keeping his equipment in different areas on the property helped avoid an even more devastating loss. The company’s server was operating as the responders fought the fire, but the water from the hoses shorted the system. While the server was destroyed, the hard drives within it were recoverable. The company used a mirrored tape drive backup, an offline 6-terrabyte storage system that copies and stores the entirety of a server. The drive held the company’s files, customer data, payroll information, emails and every other shred of vital information. Tapia always kept one copy off-site, so it would be unharmed in situations like this. The duplicate drive was up-to-date within a week, which is probably enough for most landscape businesses, Tapia says. A bank, on the other hand, with large amounts of data changing by the second, might need a minute-to-minute backup. “You have to look at your business and decide how much data you can stand to lose,” she says. Within 48 hours, Tapia would have Scott’s Landscaping’s network back up and running. Its email was functional within a few hours. The company was even able to bill clients and process payroll that Friday, five days later. In the aftermath of the fire, Burk says it was comforting to know the company’s data were safe. Burk left the scene at 3 a.m., as the fire died down. Knowing his data and file recovery efforts were in good hands, Burk’s focus would soon turn to getting operational again. He returned to the scene after just two hours of sleep and was greeted by a pleasant surprise. 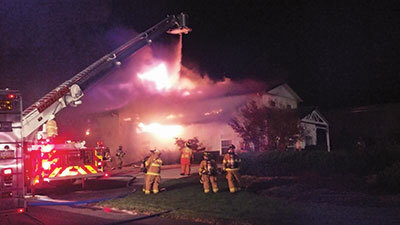 The fire was concentrated in the administrative office and repair shop, which were consumed down to the concrete slab. Most employees went to work sifting through the ashes, salvaging equipment, documents or anything else valuable and intact. 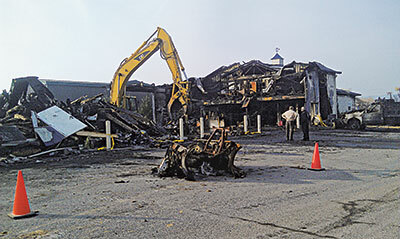 Some pieces, like the hydroseeder, a main component of the business’s service offerings, survived the fire. Luckily, the majority of Burk’s equipment was parked away from the office and shop. This included its trucks with enclosed trailers, which stored most of its tools. The separation left them mostly unaffected by the fire. With what it had, Scott’s Landscaping sent out three of 20 crews on service runs less than 24 hours after the fire. On day two, 15 crews went out for jobs. Sure, the fire took some smaller tools, which the company leaned on a rental house to replace, and a few trucks, which the company made do without until it could buy new ones, but the meat and potatoes of the company’s production capabilities remained. By the end of the week, Scott’s was fully operational. Not everyone who experiences a disaster is that lucky, says Teel. While he didn’t work with Burk, he works with many companies before and after disasters. Teel says Burk quickly responded to two vital post-disaster questions: “What are my critical business functions?” and “How do I protect the biggest sources of revenue?” By salvaging equipment and sending crews out immediately, he was able to cater to his most valuable accounts. Some companies affected by disaster take massive equipment losses that aren’t easily replaced. Think about out how you would replace the equipment you use on a daily basis, Teel says. Talk to your equipment vendors and discuss the hypothetical situation. Find out if they have the ability to deliver new or used equipment in a moment’s notice. In some cases, they might not know, and it could spark a similar conversation between the dealer and the manufacturer. Teel suggests putting a plan in place with your dealer to set up a short-term lease agreement should disaster strike. It also helps to develop formal relationships with a rental company to replace incidentals quickly. Another strategy is to lean on nearby landscape companies—maybe fellow members of state or regional associations you belong to or even a rival company—to hire as a subcontractor or to borrow equipment from. To place a customer in the hands of a competitor may go against a business owner’s competitive nature, but serving clients should be your main priority. Within two weeks of the fire at Scott’s, news reports spread through the community and the state. Businesses across Pennsylvania, including competitors, reached out to the company to offer support. Since Scott’s Landscaping’s biggest woes were in the office, not in the field, the company didn’t accept much help. But that doesn’t mean Burk didn’t appreciate the offers. “Rebuilding stronger than ever.” For the next year, the company’s newspaper ads and radio spots featured the tagline. Once the crews were operational and the administrative crisis was averted, finding permanent residence for Scott’s Landscaping was the owner’s heftiest task. The operation was split up for a month after the fire. Even though the building was gone, the external components of the business—like plant material, topsoil, mulch and equipment—were still at that site. Production crews reported to that site, while administrative employees worked from home or in a temporary building Burk rented, many miles away. Up to date As you grow, make sure your insurance policy grows, too, Scott Burk says. 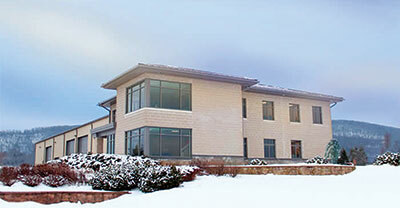 Finally, Burk had a modular office—a custom, prefabricated temporary office building—brought on-site. It had to be equipped with brand new cubicles, desks, computers, file cabinets, copiers and more, which took time. Power, internet and heat weren’t up and running immediately either. By mid-January, two and a half months after the fire, the temporary office was finally running at full capacity. Still, it was pretty close quarters. Three designers shared one office and Burk worked out of the kitchen—hardly the definition of comfort. In all, including set-up prices and a year of monthly fees, the temporary office cost the company about $50,000. “It was much less comfortable than we were used to, but at least everyone was back together,” Burk says. Almost immediately after the fire, Burk began meeting with an architect to start designs for the new structure the company would build. He hung each updated blueprint on the wall in the modular office, instilling hope in his team. They started from ground zero. Not even the concrete slab from the original building was savable. Burk had a commercial business insurance policy, which covered the structure, contents and more against fire and other threats. He also had an inland marine policy, which protected his equipment. Pretty quickly, his insurance company, the Hartman Agency, told him he’d receive full benefits. The building was a total loss, so there weren’t any disputes, Burk says. He was well covered, especially since the building insurance had been evaluated and updated the year before. Still, he wishes he paid closer attention to certain aspects of his policy, such as the contents insurance. Contents insurance is “everything that would fall out if you turned your building upside down and shook it,” Burk says. He estimates he took about a $500,000 loss on contents. The company was insured for 30 cents on the dollar. For a little bit more, he could have had much better protection. As your business grows, Burk says, it’s easy to forget to update certain aspects of your insurance, but it can be vital to survival. As the claim money came in, Burk saw an opportunity for a facilities upgrade. Insurance matched what he lost, and he used those funds as a springboard to expand. He also secured loans from various banks. In January 2015, the company moved into the newly constructed 9,500-square-foot building on the footprint of the former Scott’s Landscaping headquarters. Understandably, Burk was afraid of another wood structure. So, he built a steel-reinforced masonry building with double the office space, a second story, additional restrooms and a shop similar to the one that was lost. There is still no official record of what caused the fire. The best guess is the wind downed a power line, and the back surge damaged an electrical wire and sparked a fire, Burk says, but he admits he’ll probably never know. He also can’t really put a number on what was lost. If he could, it likely wouldn’t be accurate, he says. There are certain things you can’t put a price on. It doesn’t matter much now. When he looks back at the fire, he doesn’t see loss. Instead, he remembers the staff members that rallied around their company. Make temporary repairs—Board up blown out windows to make sure rainwater stays out, put tarps over sensitive equipment and take other steps to prevent additional damage. Take pictures—It’s an important step, Worters says. Be sure to take detailed photographs of structural, equipment and any other damage. The more detailed, the better. Gather as much documentation as possible—The insurance agency is going to want to see everything. Collect tax records, receipts and any telling information about the event. For example, Scott’s Landscaping’s IT consultant was able to show the exact moment the fire hit by tracking the servers, which was helpful during the investigation. This information will be valuable to show proof of loss when the agency conducts its inspection.